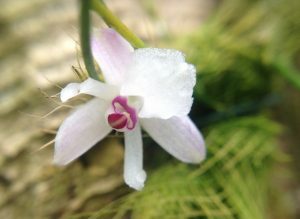 This is one of Issy’s favourite orchids – after all it seems to be named after her! Actually a lot of us count Isabellia virginalis as one of our favourite orchids. 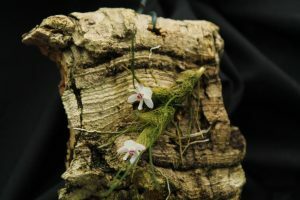 This close up shows the beautiful little flowers (thanks Ben for the photo) and then there is the interesting basket like weave of fibres around the small pseudobulbs. 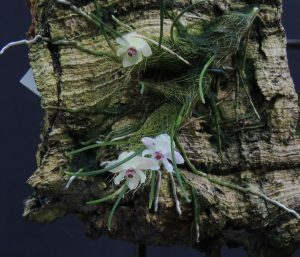 This fantastic miniature species comes from the Mata Atlantica, Brazil where it grows in cool forests with a wet summer and dryer winter (A habitat we have had the pleasure of exploring). It comes from the same habitat as many of the plants in our Cool Americas section and we grow it mounted and high up so that it has a little more light and less moisture than some of the other cloud forest species in this section. I still haven’t found any thorough research on the evolutionary advantage of the basket weave protection but perhaps it could be protection against extreme weather or pests? Unfortunately we don’t have enough plants to carry out a controlled experiment with slugs! Joe’s took this photograph of the same plant 12 months ago and the photos show that the species is growing well with quite extensive new roots and leaves. I wonder how many flowers we will get next year?